o Trash of any kind, including packaging material, plastic, paper, or any other foreign material not listed in the “Allowable Items” list. o Soups or any other liquid food items other than used cooking oil. Customers must use care during the disposal process of used cooking oil to avoid any potential spill. It is recommended that the product reach room temperature prior to transporting oil to the UCO Container. After disposing of used oil into the UCO container, any debris from the oil should be removed from the screen on the container. 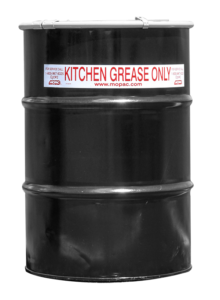 Any grease drippings on the container should be wiped clean immediately to avoid buildup. Container Lids should remain closed at all times when not disposing of used cooking oil. If a lock is installed on the container, customers should report missing locks to MOPAC. Trash and other debris surrounding the container should be removed on a regular basis. Customers should be mindful to not place any obstacle in front of a UCO container. It is important that the UCO container be accessible to both Customer employees and collection trucks at all times. During cold weather, snow should be removed from in front of, and around the container to allow access for collection trucks. Should a spill occur, the customer should immediately put absorbent material down, such as kitty litter, saw dust or any other permeable material. Customers should call MOPAC for further instructions if the spill cannot be contained.